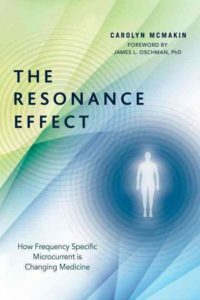 Is "The Resonance Effect" The Definitive Reinvention Of Medicine With Frequency Specific Microcurrent? Get on the eBodyFUSION list. Fill in your name and email and confirm your email address. Chiropractic doctor Carolyn McMakin's book "The Resonance Effect" - North Atlantic Books - adds an interesting dimension to the hidden in plain sight world of microcurrent, that could, according to the author, possibly be the way to change the face of medicine with Frequency Specific Microcurrent, (FSM): The subtitle of her book"The Resonance Effect, How Frequency Specific Microcurrent is Changing Medicine" somehow implies that the physics of resonance easily translate into healing for her and her clients. Branding her kind of microcurrent as "frequency specific" sparks interest, especially in regards to recent advanced microcurrent Russian research, and more of that later, so this seems timely and a great reason to read this. Also, with some form of electrotherapy having been around for thousands of years before being disavowed in the West in the 1920's in favor of pharmaceuticals, the notion of using specific frequencies for specific ailments is very compelling. However, the author's emphasis on frequencies may delude us from the fact that even with the simplest microcurrent device with only two frequencies built in, the same stupendous results she claims have been achieved already in the past. This writer is an ardent microcurrent user, and this review is written with the intent to help microcurrent users, and user-to-be, not to get sidetracked or limited by this book's emphasis on "specific frequencies" only microcurrent. Author Carolyn McMakin's is really "resurrecting" an electrotherapy treatment with frequencies widely used in the early 1900, and her story starts with Australian osteopath Harry van Gelder. coming from England to the U.S. in 1946 and buying himself a practice. And there, Harry found, left over in a back room, an old electrotherapy machine that came with a mysterious list of frequencies. The discovery story continues, some 40 years later, with Carolyn meeting George Douglas, who had trained a few months with Harry and he is in possession of that mystery list of frequencies. George, as her instructor in chiropractic college, manages to fix her shoulder with one of his nontraditional modalities, and Carolyn gets intrigued by the result. When they decide to partner up, he gifts Carolyn with a new microcurrent machine, and also introduces her to the frequency list. Full of doubts at first, together they venture out to test, if the frequencies list would work with a modern 2 channel microcurrent machine. Carolyn, having had her dreams of becoming a doctor squashed, but not her ambitions, has just freshly graduated as chiropractor doctor. Already she sets out, as her life goal, to validate that Harry van Gelder's old list of frequencies actually can do something to help people, above all, that's her mission, but doing it with the help of the frequency list. The list contains mysterious pairs of frequencies, one for body tissues and parts, and the other for different ailments. For years, Carolyn applies these frequencies to establish their efficacy in a scientific way, and to test which pairs of frequencies work for certain conditions in specific tissues, in a scientific way. But mostly, she is "intuiting" her own technique, initially. She allows her intuition to be the guide, and she gives the reader a glimpse of it: "Everything went quiet. There was a moment of inspiration and synthesis. It just felt right." In these moments she feels "resonance" happening. She has an especially puzzling case of neck pain client lying on her table. She writes: "A quiet prayer formed in my mind. Help". While praying, she sees, in her field of vision, the pair of esthetician's conductive gloves resting on that microcurrent facial machine for cosmetology treatments, done in her practice after hours. Her intuition tells her to put the two and two together: The gloves. The frequencies written on a card on her microcurrent machine next to her. "In my mind, I could suddenly see my hands in the graphite conducting gloves, and the current from one glove to the other through his neck muscles". She never had used the frequencies before, but "it felt right" to choose a specific frequency. And then the miracle happened. "His neck muscles melted". The conductive gloves she wears while she massages the client's painful neck muscles turn hot, and so does the tissue under her hands, it dramatically softens, and at the same time the client reports warmth, tension release, and pain gone. Allowing inspiration, intuition to be part of her medicine, this the author calls having a resonant moment. Arguably, was that, in that resonant moment, an effect of frequency, or was it rather the effect of electricity on blocked energetics? As much as this reader would like an explanation from her, what her "resonance effect" actually does effect in the body, in terms of biochemistry or electrobiophysics in order to bring about these sudden results, the author withholds that information, hopefully leaving it for another book? And alas, later in the book the author explains, it would take her more than a lifetime to explain this. So not in this lifetime. And isn't it more gratifying to have thousands of suffering people cured, than having some scientific healing model developed that sometime in the near future might be done with and replaced again with the next one? Again and again in her book of her many success stories, she describes a similar sequence of events, that a sudden change happens, if the right frequency pair is applied. The conductive gloves she massages with, turn hot, tissues soften, and patients feel the tissue turn warm and instantly are pain free. This warming effect by the way is not uncommon in microcurrent applications, especially in early sessions, and that without the use of any of the specific frequencies on her list. 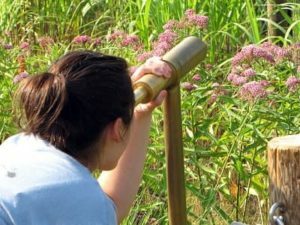 "All science starts with observation", she says. All this, she says, she had to" figure out, it was all trial and error and it took time..." She credits a lot of her findings to an inner quiet voice, calling it "the sock puppet voice in my ear". Learning to follow that inner voice she says,"I learned that if a frequency was correct, it changed the tissue in seconds....The frequency had to match the condition and the tissue." How to spread the word about the "resonance effect"
Starting in 1995, she combines her chiropractic treatments with the frequencies list and microcurrent and eventually is able to establish their efficacy. Over Guinness in a pub, together with her naturopath assistant, they create the branding "frequency specific microcurrent", short FSM, and a logo to go with. And having successfully tested which pairs of frequencies work for certain conditions in specific tissues and having developed them into protocols, she publishes her first paper. She presents her protocol for myofascial pain at the national meeting of the American Back Society, in 1997. Also, early in her career, she realizes that she has to spread the word among the next generation of health professionals and organizes her"Interdisciplinary Health Care Symposium", bringing together medical school, chiropractor college, and naturopathic college students in her area. She then lectures in England, speaks at the NIH Grand Rounds as the first chiropractor ever in its history, presents at the IFM Symposium, and, starting in 2001, with George, teaches her sponsored FSM core seminars in Australia, and that for seven years straight. She has conquered doctors in numbers, won over chiropractors, naturopaths, dentists, scientists, massage therapists, even equine massage therapists and olympic sports trainers and athletes to believe in her system. And she states, that over 2000 licensed practitioners in eleven countries are using FSM now, although I read on the internet, it's a much smaller number, and that might be an outdated number. Beyond a doubt, she gives her trainees solid advice, to stay below the radar of medical inquisition, and to play the game of "evidence-based medicine" in chapter 7 "How do you do that". She tells them to "just follow the rules" (of the FDA) which certainly is not going to change medicine but will surely will keep them in practice, with that prudent attitude. Packed with anecdotal case studies, her book is a good read, especially since she is quite refreshingly frank with her own life struggles. As a writer she successfully interweaves her own biography because it is so closely linked to her work. Her life has not been easy, challenges are many and constant, her family challenges, her mother's and then her own illnesses, her gruesome work schedule, all interwoven with case studies from extremely difficult client cases whom the medical system rejected and could not help. Yet, Carolyn comes to the rescue and they all get help from her growing list of frequencies and evolving protocols, (except those patients who drop out, seemingly lost but obviously having a secondary gain in being good servants to "traditional" medical indoctrination). By helping even the most desperate cases, especially with inflammatory diseases like chronic fatigue, fibromyalgia, myofascial pain, her practice flourishes, and with that specialty, her work load increases even more. If Carolyn McMakin's claims are as astounding as she makes us believe, then all alone she jumps to the rescue even when all other medical efforts fail. And sometimes when she jumps to the rescue, she overlooks her intuition to slow down. She gets severely ill several times, overtaxing her strength in working impossibly long hours, travelling constantly now to give seminars, teaching in clinical settings. She even ventures out into the sports arena and cures top athletes from their injuries for whole nights and days, because they are under time pressure, just like her. The facts lead us to look at the subtitle of her book "How Frequency Specific Microcurrent is Changing Medicine" more closely. Is this actually the case? Is the medicinal cesspool going to be changed that way? Or is Carolyn's desire a dream and her work doomed before it even gets going beyond her thousands of case histories? Has her job not been, so far, to pick up the broken pieces our medical system leaves behind? Does Carolyn have to do the mop up work, and business goes on as usual in medicine? Let's be practical here. A total medical reset is needed across the planet. The questions are numerous, but is Carolyn's work the only representative of the most up to date research in microcurrent or simply a rehash of the other electrotherapy from bygone years? And what about the millions that are being funded by the pharmaceuticals with microcurrent implants? Is medical practice, and starting out, medical education, not leaving out something really important, that is needed in order to heal? Is it her ability to allow into her practice, what doctors would call "unscientific methodology", her enlisting a strong dose of inspiration, of intuition, poetry, even prayer, into her medical repertoire, all that what a classically indoctrinated medical doctor likes to call "woo-woo"? What does Dr. Carolyn have that medical doctors don't? Is Carolyn McMakin ahead of the times? Or rather, did the medicine of old not have these qualities, when shamans and medicine men did the healing? Interestingly, Carolyn answers exactly that point. Using as an example for resonance the key fob beeper on a car key chain, and how the car door gets opened or closed, she says "that's not woo-woo or magic, it's physics.....". 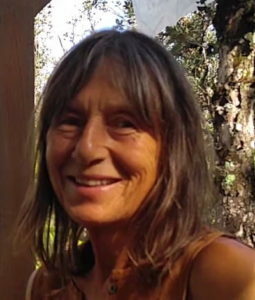 She insists on being scientific, yet she points out in her book how Harry van Gelder's holistic concept of the body system is far ahead and superior to what today's medical establishment parctices, and she acknowledges that medicine is as much a science as it is an art, or is that woo-woo again? She insists on being scientificand part of the crowd even when the whole medical system is a convoluted cesspool of doctored double blind studies, pharmaceutical kickbacks, toxic vaccinations, cell cooking microwaves and WiFi blindness. It's a miracle that she is still working with a medical licence. What is really her relationship to the medical system? 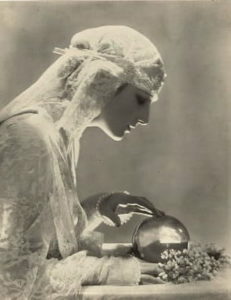 When teaching her first class in FSM, she afterwards bitterly regrets that she spent too much time on "historical, nonspecific microcurrent and not enough on frequency effects". Was that the reason she now skips microcurrent history altogether in her book? But yes, in the beginning, the book goes into the history of electrotherapy a bit, just a little bit. So bear with me when I'll add some history on my own. 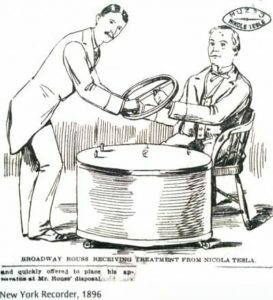 Carolyn tells, that in the early 1900s electrotherapy was big in Europe as well as in America, and that electrotherapy had become hugely popular with doctors who used electricity to successfully treat an amazing range of different diseases. I remember a friend telling, living in Hot Springs, Arkansas, and on his almost daily visits to the hot springs seeing inside the bath houses displays of old electrotherapy devices (since then removed) hanging there from the early 1900. It is tempting to make the connection to Carolyn McMakin's work, how it is based on just one of these old machines going back to 1922. And connecting to the spirit of those times back then when all that, what we now call modalities, were all accepted ways to cure and coexisted peacefully in helping people, when these old ways were not coined "woo-woo" but employed for helping to heal, when "Mother Nature" was still part of it, with walking barefoot in wet grasses, putting people high up in the Swiss Alps into sunshine and fresh air to cure lungs, and so on. The book explains, the demise of electrotherapy started in 1910 when the Flexner Report outlawed electrotherapy, and it was final around the Fifties when all electric equipment had ended up in back rooms with sheets put over them. Doctors would loose their licence when practicing any of it. 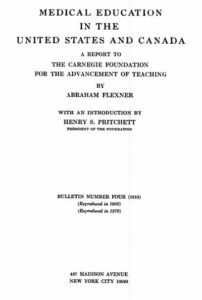 The Flexner Report had infiltrated medicine in a very unhealthy way and has to this very day, even though we have watered down "modalities" But there is this deep rift which pharmacology has created in medicine, with its insistence on chemistry only, leaving the benefits of physics out, as in Carolyn's work, and the word physics only appears in adjunct therapies like physical therapy. My own research shows that electrotherapy goes back a long way in history, from thousands of years in the Orient, to the use in ancient Rome of shallow ponds with electric eels to cure depression and lethargy, after second emperor of Rome Numa Pompilius building himself some kind of an electricity lab and experimenting and creating some kind of a battery, and up to the invention of batteries in the 1880s. Like Numa Pompilius maybe had found already, batteries created a dependable source of electricity, and that made electrotherapy thrive in the early 1900. And then, how it got actively persecuted and squashed and killed off, nobody seems to talk much about or gets excited about much Although Carolyn gives us a short rundown on the Flexner Report, and I am grateful for that information, later on in the book she just sums up the demise of electrotherapy with her detached statement ," it fell out of favor", just like Google almost belittles it as "funky looking electrical equipment that fell out of use in the 1940". But the author brings in the AMA but the the blame rests on the Flexner Report, which as early as 1910 began to streamline medicine into a corporate moneymaking enterprise, and eventually outlawing electrotherapy devices. And squashing not only electrotherapy but everything non pharmaceutic or “alternative”, then in use, "like homeopathy", in favor of surgeries and drugs. Forbidding doctors to use electrotherapy they were forced to give it up or go underground, and that created a huge disconnect in medical practice to this day. 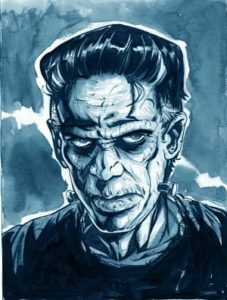 That brings up the idea, that even Hollywood was employed in the Flexner demonizing electricity, with the “Frankenstein” movies to infiltrate and manipulate popular beliefs about electricity by giving it shock value, a jolt of horror to create fearful associations with electricity and electrotherapy to this day. This indoctrination is still in effect when friends and family show objections to trust the healing power of electricity, or even hesitate to try out a microcurrent device on their arm. How difficult it must be to market these to a mainstream audience I can only imagine. Following the book's story line, after being shut down for nearly seventy years or so, electrotherapy needed a “resurrection”, and for Carolyn resurrecting becomes the story of her life for Carolyn and the first chapter of her book, she calls it "Resurrecting Resonance". 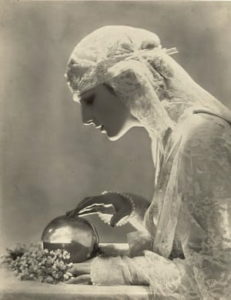 To bring back electrotherapy it seems it took someone like Carolyn McMakin, inspired and totally supported by George Douglas, her mentor, and partner, and that forgotten machine from 1922, to double up with an ancient frequency and to turn it into a healing business again. As it turns out, the rest of the world has not been sleeping either. Europe did not have a Flexner Report, (although it is very probable, that the repercussions of that deleterious message indoctrinated medicine everywhere). And even before Carolyn's scientific inquiries, micro had made strides already in Europe in the late Seventies. Microcurrent devices according to Google have been around since the 1980s. At that same time Russian SCENAR clinical trials had been done on 18,255 people with 88.25% average cure rates in all major disease groups, all achieved simply with a few basic frequencies. And later many people had life changing healing success with the early banana shaped "black sheep" DENAS SCENAR which has only two specific microcurrent frequencies! So, what is the big hush about microcurrent in her book? Maybe she is being prudent, because she does mention the FDA visiting and interrogating her for 20 hrs. and requiring a 14 page affidavit. Who then wouldn't be afraid to talk too much about microcurrent? Is it, that microcurrent works so well, that the medical system wants none of it, and that because there is no money in it? Is Carolyn McMakin just a singular phenomenon within the medical system, somewhere in the woo-woo category, but tolerated because she helped too many people to be ignored? And is the handheld pocket size very handy microcurrent device, only the very clever know about, a threat to the giant business of traditional blood and gore medicine? Whatever the case, Carolyn McMakin's effort is a heroic one and needs to be acknowledged big time, and having written her book she is going to be an important role model for many that way. She literally has helped thousands of clients out of their misery, and that's really the book's meant testimony. It is the sheer weight of her accomplishment, as a chiropractic doctor, her scientific exploration aside, that make her book, and her life story, so rich. And for the reader it's a revelation of read about her client's sufferings, last but not least coming from the ignorance of the medical system that cannot or does not help them. Her case study results and successes are believable, yet we know, that's what happens in the microcurrent world. What others might call miracles, that's what the body does when charged up with electricity, employing its innate healing powers, and that is what everyone's testimony of using microcurrent sounds like. And it's common knowledge that it has been proven already in the original clinical trials in Russia back in the Eighties, with their phenomenal cure rates of 88.25 % in all the major disease groups, so that the results she gets are nothing new. Surprisingly the author never mentions any of this. Carolyn McMakin has worked very hard and long hours, and that for decades, diligently pursuing individual frequencies one by one and experimenting with each one of them, authoring 8 clinical research papers, and even a textbook for her thousands of students. 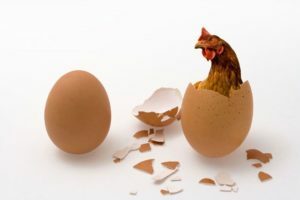 She genuinely, through research and clinical studies, arrived at her system, crediting each specific frequency for her successes with clients, which were rejects from the medical system deemed "incurable". And she decided to publish this frequency list and go public, and that way she avoids patenting, and anybody can go ahead and use them. The only thing, her FSM Advanced Course teaches an additional six hundred plus frequencies for additional tissues and frequencies.With that astronomical number of frequencies, to me it sounds impractical, when to me it does perfect sense to simply treat oneself with what she calls"nonspecific" microcurrent and get the results. It could, it seems, simplify that whole medical drama. Insisting that only the "right frequency" for each different disease and only the right frequency for each target organ or tissue together do the trick, maybe deludes the fact that it is electricity that does the cure. Even the simplest and totally natural microcurrent stimulation with, say, grounding can render a similarly wide spectrum of results that can be attributed to connecting to the earth's electron reservoir. Will this narrowed down emphasis on specific frequencies not confuse the issue? That it is electrons as a pure energy source derived from electricity that do the healing, not a specific number of pulses or beats per second? What makes her claim seem an exaggeration and therefore unconvincing to me is her lack of exploration on her part, by disregarding the highly sophisticated handheld microcurrent devices on the market with tens of millions of these devices sold. These also have specific frequencies, a simpler method of application with built in electrodes so no need for wet towels, gels or gloves and the high end professional come with high and ultra low frequencies. One such line manufactured in the US are the FDA approved Avazzia microcurrent devices. Also, the millions of SCENAR and DENAS devices which have been in use widely with even wider ranges of clinically proven results now in various medical disciplines. And similar to not mentioning the Russian clinical trials done with SCENAR in the 70s and 80s, Carolyn McMakin's perspective on present day microcurrent electrotherapy remains, in my opinion, blotchy throughout the book. Why no mention of neuropeptides? The common ground is the use of microcurrent, the innate beneficial, healing properties and healing secrets of electricity. But it is my understanding, that it is the whole range of frequencies in microcurrent electricity that, when infused into the body, recharges the system with enough energy to solve pain and mobilizes the self healing capacities in the body. As in the case of the before mentioned Russian microcurrent devices, microcurrent electricity also initiates the secretions of neuromodulators and neuropeptides, as newest research is pointing out, and not only for the rejuvenation, but the regeneration of tissues. Apart from what successes she can claim in her doctor’s practice, Carolyn McMakin still operates within a system where the doctor-patient or therapist-patient dependency is fully intact. 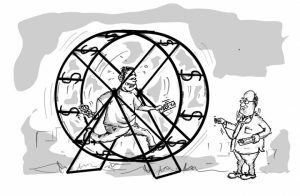 But then there is that ideal vision where patients are not getting sicker and sicker but are empowered to take charge of their own health, becoming independent of the medical system, by stepping out of the deadly medical treadmill altogether. People who are better informed about healthy lifestyle choices, trained to work with microcurrent devices they own. People fully aware of how their bodies work, using microcurrent in a responsible way, including the inevitable healing crises, and caring for their body's electrical needs with their handheld devices. And just as intended by the Russian microcurrent inventor Dr. Alexander Karasev, these are aimed at bringing the patient from dependency on the medical system to medical sovereignty, getting him off the medical treadmill to take charge of his own health and well-being. To the FDA, all microcurrent rates under the TENS category, approved for pain control only, the author informs us. Yet she barely mentions the significance of the signal’s difference between a TENS machine and microcurrent, or are they not different after all? To me, what she says is not in any way conclusive and it does not include biofeedback organic signal either. Carolyn informs us, that TENS units are only available by prescription from a health professional, but if you look on Amazon, there they are thousands of TENS 5 star reviews, from 30 dollars a piece. This, and other glitches make me wonder if there are more of them in her book that I might not be aware of. "there are other devices out there created to take advantage of the market FSM has created". However, and don't get me wrong, I fully respect Dr McMakin’s contribution, her findings and results, and it's quite engaged because of so many success stories she cannot fit them all in her book, as she says. And she seems to really engage with patients and her focus is her findings and working with her frequency list. Maybe Frequency Specific Microcurrent is marketing branding? It appears from these facts that it's not her aim to be a team player in the microcurrent world. It's more that “my frequency or the highway” kind of approach. And that has happened, too, in other areas like in homeopathy. Medical science's divide and conquer tactics compartmentalize body parts and medical diagnosis. Instead, lets not forget, the body is a holistic vibrating system with dynamic microcurrent pulses that have a wide homeostatic effect, from brainwave entrainment to neurogenic secretions from nerve fibers, muscle re-education, pathogen killing, scar tissue softening, regeneration of tissues. These qualities have helped millions and are used in pain management clinics, by chiropractors and salons for cosmetology. And guess what all these effects happen by walking barefoot and connecting to the earth's electrical reservoir, known as grounding. To recap, this book is lacking in the data of what we know from microcurrent research that has been done for years by universities all over the world. From what she calls "nonspecific microcurrent," we microcurrent users already know, it is no big deal to dissolve scar tissue, it's no big deal to soften muscles. What she claims as being miraculous, it's kind of funny when it’s kind of ordinary in the microcurrent world. Then, Carolyn's way might just be another "highway", and, as the saying goes, many roads lead to Rome. In her last chapter "In Their Own Words" the happy testimonials from patients, practitioners, and practitioners who were also patients, speak for themselves. Trying to catch the author on gritty details does not do her justice. She has written a beautiful book. A book with much food for thought, and a bright future for health and wellness. Kudos! Author Lin de Berger: a German documentary maker turned psych and alternative nurse used microcurrent to recover from 10 years of COPD. She is a strong advocate of daily use of microcurrent. Retired in Hawaii she practices yoga daily and loves gardening. Allen, J.D., Mattacola, C.G., Perrin, D.H. Effect of microcurrent stimulation on delayed onset muscle soreness: a double blind comparison. Journal of Athletic Training. 1999;34:334–337. Armstrong, R.B. Mechanisms of exercise-induced delayed onset muscular soreness: a brief review.Medicine and Science in Sports and Exercise. 1984;16:529–538. Barzansky, B.S., Gevitz, N. Beyond Flexner: Medical Education in the Twentieth Century. Greenwood Press, Westport, CT; 1992 (pp. 195–222). Becker, R.O., Seldon, G. The Body Electric: Electromagnetism and the Foundation of Life.Quill/William Morrow, New York; 1985. Berliner, H.S. A larger perspective on the Flexner report,. International Journal of Health Services. 1975;5. Bertolucci, L.E., Grey, T. Clinical comparative study of microcurrent electrical stimulation to mid-laser and placebo treatment in degenerative joint disease of the temporomandibular joint. Cranio: The Journal of Craniomandibular Practice. 1995;34:602–607. Cheng, N. The effect of electric currents on ATP generation, protein synthesis and membrane rat skin. Clinical Orthopedics. 1982;171:264–272. Cheung, K., Hume, P., Maxwell, L. Delayed onset muscle soreness: treatment strategies and performance factors. Sports Medicine. 2003;33:145–164. Clarkson, P.M., Byrnes, W.C., McCormack, K.M., Turcotte, L.P., White, J.S. Muscle soreness and serum creatine kinase activity following isometric, eccentric and concentric exercise. International Journal of Sports Medicine. 1986;7:152–155. Cleak, M.J., Eston, R. Muscle soreness, swelling, stiffness and strength loss after intense eccentric exercise. British Journal of Sports Medicine. 1992;26:267–272. Connolly, D.A.J., Sayers, S.P., McHugh, M.P. Treatment and prevention of delayed onset muscle soreness. Journal of Strength and Conditioning Research. 2003;17:197–208. Cornwell, A., Nelson, A.G., Sidaway, B. Acute effects of stretching on the neuromechanical properties of the triceps surae muscle group. European Journal of Applied Physiology. 2002;86:428–434. Craig, J.A., Cunningham, M.B., Walsh, D.M., Baxter, G.D., Allen, J.M. Lack of effect of transcutaneous electrical nerve stimulation upon experimentally induced delayed onset muscle soreness in humans.Pain. 1996;66:285–289. Denegar, C.R., Perrin, D.H. Effect of transcutaneous electrical nerve stimulation on pain, decreased range of motion and strength loss associated with delayed onset muscle soreness.Journal of Athletic Training. 1992;27:200–206. Electronic Medical Digest. Electronic Medical Foundation, San Francisco, CA; 1951 (Paper copy in rare book room at National College of Naturopathic Medicine, Portland Oregon). Gleeson, M., Almey, J., Brooks, S., Cave, R., Lewis, A., Griffiths, H. Haematological and acute-phase responses associated with delayed-onset muscle soreness in humans. European Journal of Applied Physiology. 1995;71:137–142. Grimnes, S. Electrovibration, cutaneous sensation of microampere current. Acta Physiologica Scandinavica. 2008;118:19–25. Grossman, J.M., Arnold, B.L., Perrin, D.H., Kahler, D.M. Effect of ibuprofen use on delayed onset muscle soreness of the elbow flexors. Journal of Sport Rehabilitation. 1995;4:253–263. Herbert, R.D., Gabriel, M. Effects of stretching before and after exercising on muscle soreness and risk of injury: systematic review. British Medical Journal. 2002;325:468. Howell, J.M., Chleboum, G.S., Conatser, R.R. Muscle stiffness, strength loss, swelling and soreness following exercise induced injury to humans. Journal of Physiology. 1993;464:183–196. Huskinson, E.C. Measurement of pain. Lancet. 1974;2:1127–1131. Jakeman, P., Maxwell, S. Effect of antioxidant vitamin supplementation on muscle function after eccentric exercise. European Journal of Applied Physiology. 1993;67:426–430. Joyce, C.R.B., Zutshi, D.W., Hrubes, V., Mason, R.M. Comparison of fixed interval and visual analogue scales for rating chronic pain. European Journal of Clinical Pharmacology. 1975;8:415–420. Kaminski, M., Boal, R. An effect of ascorbic acid on delayed-onset muscle soreness. Pain. 1992;50:317–321. Kirsch, D.L. A basis for understanding microcurrent electrical therapy, part I. The American Chiropractor. May–June 1996;:30–40. Kirsch, D.L. How to achieve optimal results using microcurrent electrical therapy for pain management, part II. The American Chiropractor. Sept–Oct 1997;:12–14. Kirsch, D.L., Lerner, F.N. Electromedicine the other side of physiology. in: R. Weiner (Ed.) Pain Management: a Practical Guide for Clinicians. Vol. 2. fifth ed. CRC Press LLC, Boca Raton, Florida; 1998(Chapter 55). Kraemer, W.J., Bush, J.A., Wickham, R.B., Denegar, C.R., Gomez, A.L., Gotshalk, L.A., Duncan, N.D., Volek, J.S., Newton, R.U., Putukian, M., Sebastianelli, W.J. Continuous compression as an effective therapeutic intervention in treating eccentric-exercise-induced muscle soreness. Journal of Sport Rehabilitation. 2001;10:11–23. Lambert, M.I., Marcus, P., Burgess, T., Noakes, T.D. Electro-membrane microcurrent therapy reduces signs and symptoms of muscle damage. Medicine and Science in Sports and Exercise. 2002;34:602–607. Lanier, A.B. Use of non-steroidal anti-inflammatory drugs following exercise-induced muscle soreness. Sports Medicine. 2003;33:177–186. Lee, K.A., Kieckhefer, G.M. Measuring human responses using visual analogue scale. Western Journal of Nursing Research. 1989;11:128–132. Lightfoot, J.T., Char, D., McDermott, J., Goya, C. Immediate post exercise massage does not attenuate delayed onset muscle soreness. Journal of Strength and Conditioning Research. 1997;11:119–124. Manley, T. Microcurrent Therapy Universal Treatment Techniques and Applications. Manley and Associates, Corona, California; 1994. Mattacola, C.M., Perrin, D.H., Gansneder, B.M., Allan, J.D., Mickey, C.A. A comparison of visual analogue scale and graphic rating scales for pain and intensity following DOMS.. Journal of Sport Rehabilitation. 1997;6:38–46. McIntyre, D.L., Reid, W.D., McKenzie, D.C. Delayed muscle soreness: the inflammatory response to muscle injury and its clinical implications. Sports Medicine. 1995;20:24–40. McHugh, M.P., Connolly, D.A.J., Eston, R.G., Gleim, G.W. Exercise-induced muscle damage and potential mechanisms for the repeated bout effect. Journal of Sports Medicine. 1999;27:158–170. McMakin, C., Gregory, W., Philips, T. Cytokine changes with microcurrent treatment of fibromyalgia associated with cervical spine trauma. Journal of Bodywork and Movement Therapies. 2005;9:169–176. McMakin, C. Microcurrent therapy: a novel treatment method for chronic low back myofascial pain. Journal of Bodywork and Movement Therapies. 2004;8:143–153. McMakin, C. Microcurrent treatment of myofascial pain in the head, neck and face. Topics in Clinical Chiropractic. 1998;5:29–35. Myles, P.S., Troedel, S., Boquest, M., Reeves, M. The pain in visual analogue scale: Is it linear or nonlinear?. Anesthesia and Analgesia. 1999;89:1517–1520. Newman, D.J., McPhail, G., Mills, K.R., Edwards, R.H. Ultrastructural changes after concentric and eccentric contractions on human muscle. Journal of Neurological Science. 1983;61:109–122. Newman, D.J., Mills, K.R., Quigley, B.M., Edwards, R.H.T. Pain and fatigue after concentric and eccentric contractions. Journal of Clinical Science. 1983;64:55–62. Nosaka, K., Clarkson, P.M. Muscle damage following repeated bouts of high force eccentric exercise. Medicine and Science in Sports and Exercise. 1995;27:1263–1269. Nosaka, K., Clarkson, P.M. Changes in indicators of inflammation after eccentric exercise of the elbow flexors. Medicine and Science in Sports and Exercise. 1996;28:953–961. O'Grady, M., Hackney, A.C., Schneider, K., Bossen, E., Steinberg, K., Douglas, J.M., Murray, W.J., Watkins, W.D. Diclofenac sodium (voltaren) reduced exercise-induced injury skeletal muscle.Medicine and Science in Sports and Exercise. 2000;32:1191–1196. Oschman, J. Energy Medicine, The Scientific Basis. Churchill Livingston, Edinburgh; 2000. Petrofsky, J., Schwab, E., Cuneo, M., George, J., Kim, J., Almalty, A., Lawson, D., Johnson, E., Remigo, W. Current distribution under electrodes in relation to stimulation current and blood flow: are modern electrodes really providing the current distribution during stimulation we believe they are?.Journal of Medical Engineering and Technology. 2006;30:368–381. Proske, U., Weerakkody, N.S., Percival, P., Morgan, D.L., Gregory, J.E., Canny, B.J. Force-matching errors after eccentric exercise attributed to muscle soreness. Clinical and Experimental Pharmacology and Physiology. 2003;30:576–579. Rowley, B.A., McKenna, J.M., Wollcott, L.E. The use of low level electric current for the enhancement of tissue healing. Biomedical Scientific Instrumentation. 1974;10:111–114. Sayers, S.P., Knight, C.A., Clarkson, P.M., van Wegan, E.H., Kamen, G. Effects of ketoprofen on muscle function and sEMG after eccentric exercise. Medicine and Science in Sports and Exercise. 2001;33:702–710. Sellwood, K.L., Brukner, P., Williams, D., Nicol, A., Hinman, R. Ice-water immersion and delayed-onset muscle soreness: a randomized controlled trial. British Journal of Sports Medicine. 2007;41:392–397. Stauber, W.T., Clarkson, P.M., Fritz, V.K., Evans, W.J. Extracellular matrix disruption and pain after eccentric muscle action. Journal of Applied Physiology. 1990;69:868–874. Taleg, T.S. Residual muscular soreness as influenced by concentric, eccentric and static contractions. Research Quarterly. 1973;44:458–469. Tiidus, P.M., Shoemaker, J.K. Effleurage massage, muscle blood flow and long-term post-exercise strength recovery. International Journal of Sports Medicine. 1995;16:478–483. Warren, G.L., Jenkins, R.R., Packer, L., Witt, E.H., Armstrong. Elevated muscle vitamin E does not attenuate eccentric exercise-induced muscle injury. Journal of Applied Physiology. 1992;72:2168–2175. Wilmore, J.H., Costill, D.C. Physiology of Sport and Exercise. second ed. Human Kinetics, Leeds; 2004. Yamaguichi, T., Ishii, K. Effects of static stretching for 30 seconds and dynamic stretching on leg extension power. Journal of Strength and Conditioning Research. 2005;19:677–683. eBodyFUSION offers training and wellness coaching specializing in microcurrent electrotherapy application strategies to quickly get results to solve your pain, boost your energy and rejuvenate. Please don't interpret any of my results as some sort of promise or implication of you or your client's future performance and wellness. The GREAT results I get aren't even remotely typical. I've been at this for 15 years, and consequently have a bit of an advantage because I think out of the box and have not been indoctrinated by medicalese. The average person who buys any of my services from me (or something similar) may not get any results at all. Kind of like how the average person who buys home exercise equipment rarely ends up looking like the person in the commercials. However, as a wellness coach I will give you my all to help you succeed, but the hard work is up to you to follow through and learn how to apply the cutting edge advanced coaching protocols that finally explain what is happening and what to do.